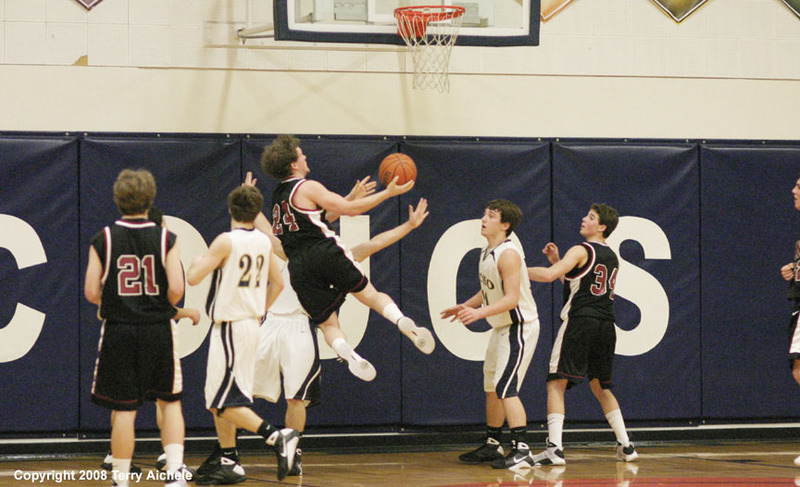 Cory Peterson of Ione flies towards the basket during the game on Saturday night. 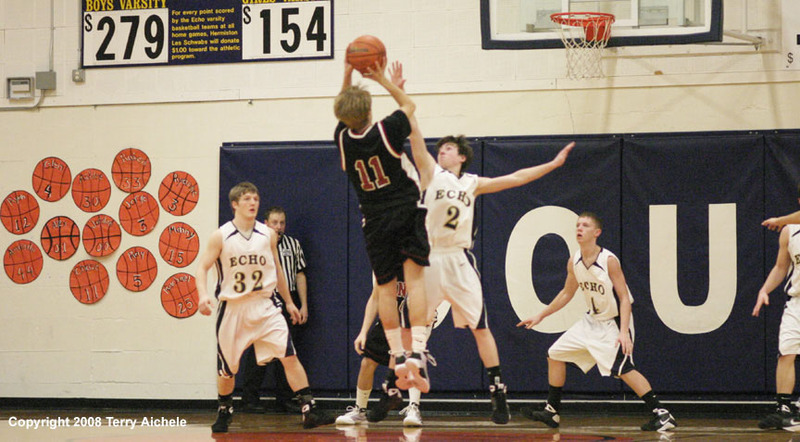 ECHO - The Echo Cougars defeated the Ione Cardinals on Saturday, January 24, 2009. Echo led throughout the entire game. The Cougars showed athleticism and good teamwork in the win. 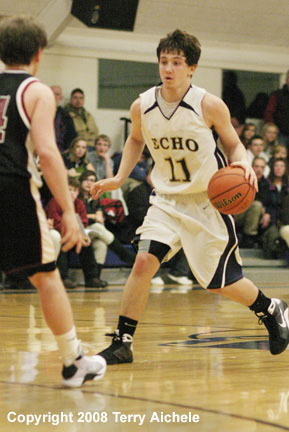 Echo led at the end of the first period 15-9. Echo held Ione scoreless for about seven minutes between the first and second periods. The Cougars scored 18 points during that time taking a 29-9 lead at 3:26 of the second period. Branden Williams, Jorge Munoz, Andy McFarlane, Jacob Eby, and Colter McCallum scored for the Cougars. The Cougars led 34-17 at halftime. The Cougars explosive scoring slowed slightly in the third period. Both teams scored nine points for the period. 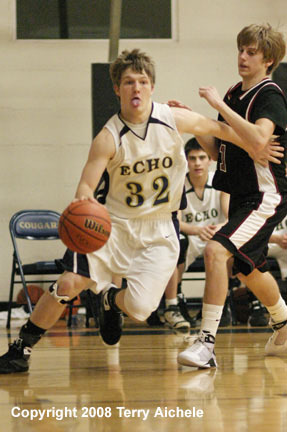 Echo led at the end of the third 43-26. Ione outscored Echo 15 to 10 in the fourth period but that meant the Cardinals had only closed to within 12 points of Echo at the end of the game. Echo still won by a substantial score of 53-41. Scorers for Echo included Andy McFarlane with 18, Colter McCallum 10, Braden Williams 8, Micah Danner 7, Jorge Munoz 6, Glen Swanger 2 and Bryan Ibarra 2. The Cougars were 17 for 45 from the field, 1 for 9 from the three point line and 18 of 29 from the freethrow line. 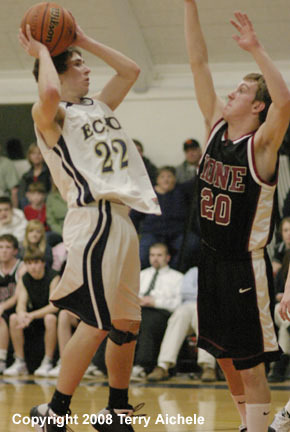 Ione player stats include Matt Hamms with 16, Zac Orem 10, Clay Morter 9, Gunner Jensen 4, RJ Ramos 1, and Cory Peterson 1. The Cardinals were 17 for 56 from the field and 7 for 19 from the freethrow line. LEFT - Jorge Munoz of Echo makes his down the court even with a Cardinal trying to knock the ball free. 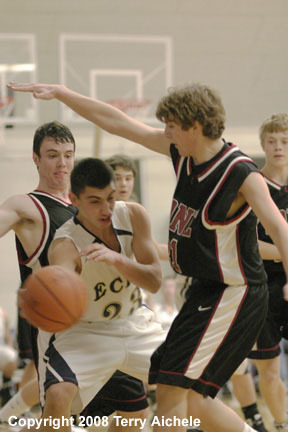 RIGHT - Colter McCallum of Echo comes up against Alex Fetterhoff of Ione. 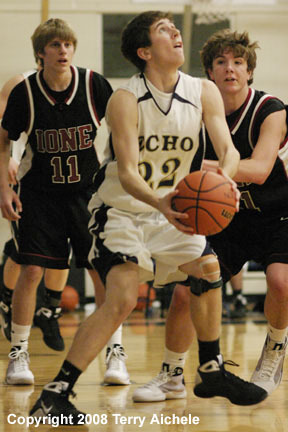 LEFT - Ray Harris of Echo tries to make his way through the Ione defense. 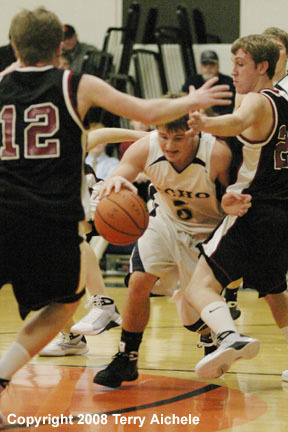 RIGHT - Micah Danner of Echo works the baseline. LEFT - Cougar Colter McCallum manuevers for a reverse layup. 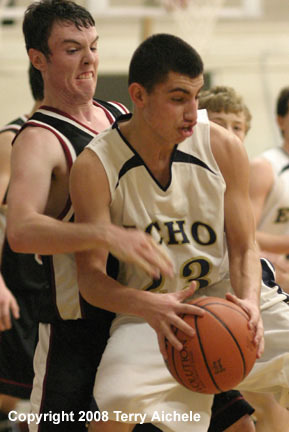 RIGHT - Andy McFarlane of Echo with the ball looks for a way around a Cardinal defender. LEFT - Bryan Ibarra of Echo is pressured by a Cardinal defender. 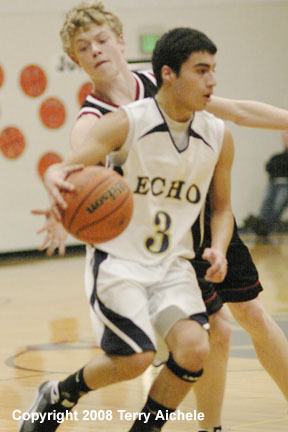 RIGHT - Echo Cougar Bryan Ibarra passes the ball around a Cardinal defender while cornered along the baseline.